It's no secret that the holidays involve some pretty epic food making. Cookies abound, turkey dinners multiply and gourmet deliciousness abounds, especially on New Year's Eve. Now, I'm no fan of the "amateur hour" NYE party at some random venue surrounded by strangers and overpriced drinks; I'm more of a "gathering with drunken friends at someone's house" kinda guy, especially since it usually involves an epic spread of food, but I've also enjoyed the "multi-course dinner at your favourite restaurant" route in some recent years. Since the kid was born, however, New Year's necessarily mellows itself out. But mellow doesn't mean boring, at least not when it comes to food. Knowing that it was very unlikely that I'd be leaving the house that evening, Kari and I started brainstorming our plan for what we were going to stuff in our gobs. 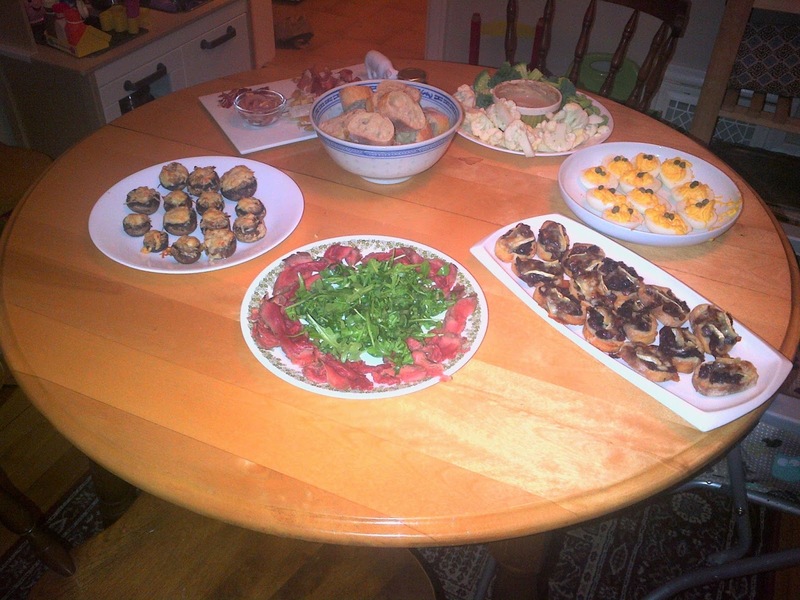 I thought it might be fun to go with a small plate/hors d'oeuvre/buffet style-meal. She agreed and the ideas started flowing. - Caramelized Onion, Cranberry and Brie "Toastettes"
So, what *is* all this stuff? Well, let's break it on down. I am a very lucky, or clever, fellow because I came across a fun little service back in the Summer called the Carnivore Club and signed up without a second thought. I regret it not at all; I've had the joy of tasting tasty cured meats from all across the country even the world, from Canadian salmon jerky to South African biltong to French Rosette de Lyon sausage. But the latest box might have been the best yet, with Spanish meats galore. It came with two huge cured sausages, one a Chorizo, the other a "Salchichon" (Spanish for sausage, I'm guessing), some Prosciutto from Pingue Prosciutto out of Niagara and a sampling of Iberico Jamon, one of rarest hams in the world. We'd already eaten most of the Chorizo so I saved it for another day, but the rest of the box had barely been touched. So, on the board you go! We also had a bit of a "Tomme" French-style sheep's milk cheese from Milkhouse Farm and Dairy left over in the fridge, nearly begging to be thrown into the NYE festivities so that was added, but we also needed a little bit of pickly vegetation on there. I almost picked up some gherkins, but decided instead to pickle some onions. I chose wisely. So how did it all taste? I'll start with the Proscuitto, which I've had before at various restaurants but is somehow better at home. It was delicate and buttery, with a melt-in-your-mouth quality and a beautiful restrained saltiness. The Salchichon was reminiscent of summer sausage, but of a quality beyond anything I'd had before. Part of this was because of the Iberican pigs it came from, called "pata negra" or black hoof pigs. These are among the most prized pigs in the world and their diet consists mainly of acorns, lending their meat a wonderful nutty quality. This came across in the salchichon, as well as its fat having a soft, silky almost creamy texture and flavour. I don't usually rave about pig fat, but holy crap, PIG FAT!!! It's a bit hard to describe the Tomme cheese because it had so many flavours at play. It had the dry saltiness of a parmesan, but much more restrained. Yet on top of that, there was a cramy, velvety quality that counterplayed against with the distinct "barnyard" aroma and flavour from the sheeps'milk. All in all, a really interesting bite. - Place onions, garlic and lemon in a large clean mason jar. - Combine all other ingredients in a saucepan and bring to a boil. - Place a funnel over the jar's opening and pour boiling liquid into jar. - Using a knife or spoon or stick or something, make sure all veggies are covered by liqiuid. - Allow to cool to at least room temperature before serving or refrigerating. These onions are *very* tasty (I frankly surprised myself with how good they are) and add a nice acidity to counter all the salt from the meat. That being said, the delicacy of the delicacy that is Jamon Iberico was not a good pairing with the onions. I've since found the onions also make a good side for meatloaf and pierogies. 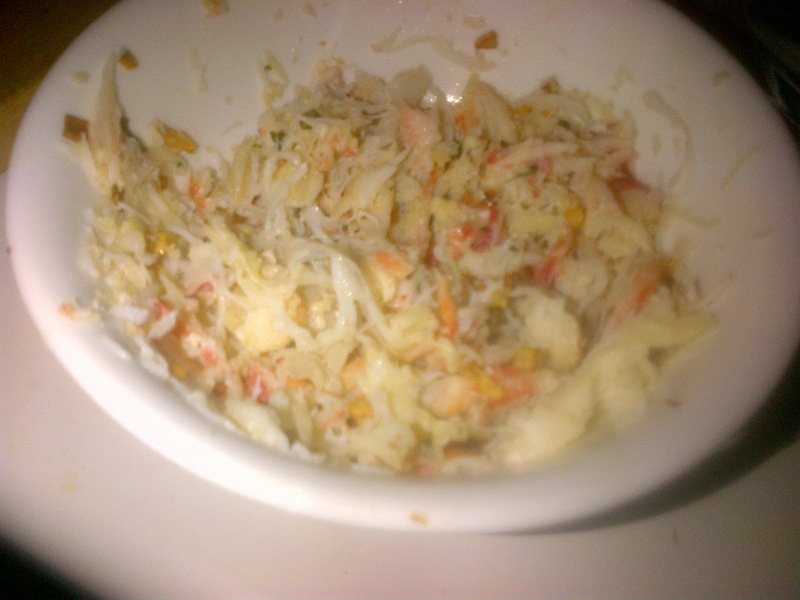 - In a bowl, mix together crab meat, garlic, panko, melted butter, lemon juice, parsley (if using; I didn't have any in the house, but I would have used it if I had) and salt and pepper. 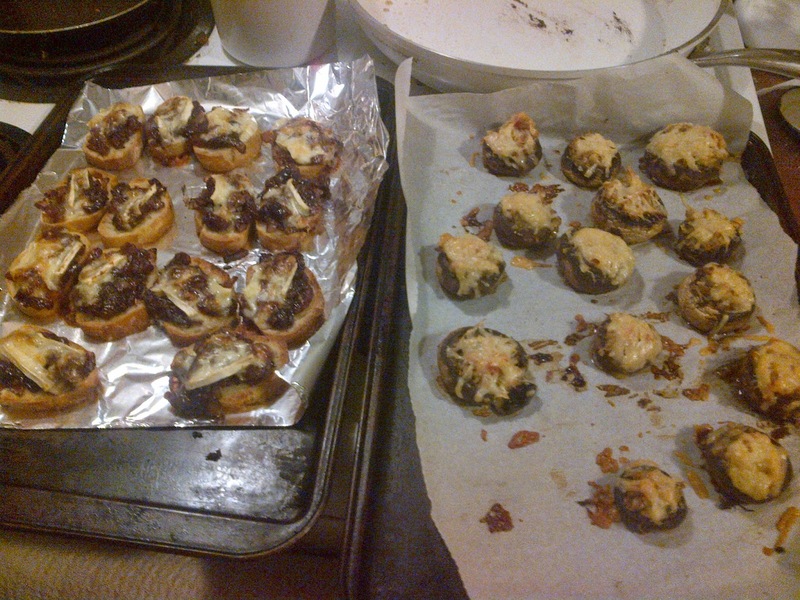 - Stuff mushrooms with mixture and top with cheese. - Cook in oven for 10-15 minutes, until cheese is melted and golden brown. Serve hot! The flavours of the mushrooms were very straight forward and complimentary: garlic, butter, crab, lemon and mushroom all play well together. Next up were the Caramelized Onion, Cranberry and Brie "Toastettes" (I have no better name for them), which were basically a variation on bruschetta, consisting of a kind of compote with caramelized onion and dried cranberries, topped with melted brie. It's just about the simplest way to whip together a quick appetizer. Here's the recipe! Caramelized Onion, Cranberry and Brie "Toastettes"
- Melt butter and sauté onions and garlic for about 2-3 minutes, reduce heat to low-medium. - Spoon onion mixture onto baguette pieces, top with brie and bake in oven for 10 minutes until cheese is melted and golden. Serve hot! A fantastic mix of rich and sweet, this appetizer is a stalwart in my recipe book, especially since it's so damn easy to make. So that does it for part 1 of our NYE snarf-o-rama! I'll be back next time to show off my carpaccio-making and more!